The party and bike ride to celebrate the launch of the new guidebook Where to Bike Philadelphia is back on. Join fellow cyclists on Thursday, September 29th at Cadence Cycling in Manayunk for light snacks and cold beer. 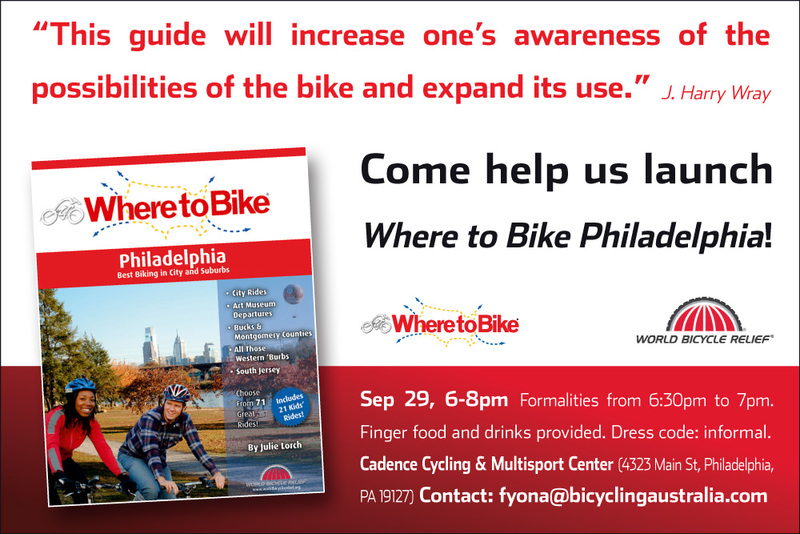 Author Julie Lorch will be available to sign copies of Where to Bike Philadelphia after hosting a leisurely 30 minute ride along the Schuylkill River from downtown Philly to Manayunk. To join the ride, meet 5:30 pm at Lloyd Hall (1 Boathouse Row) on Kelly Drive. Let's hope for better weather this time around! See you at Cadence on September 29th. This looks great. I hope to be there!